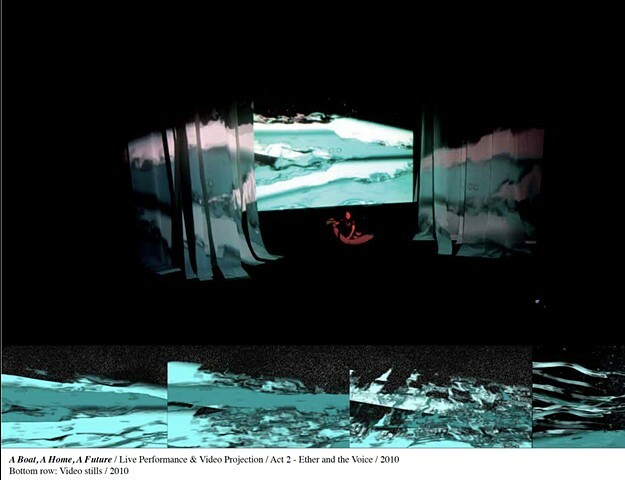 Documentation and video stills from Ether and the Voice: an Electronic Media Opera. Act 2: A Boat, A Home, A Future. "I would die for a telephone. What was a boat is now a home. Oh send me something trivial. Like smiley faces, x's and o's. Ether and the Voice is a work of science fiction, an exploration of female voice, technology and identity. Keough creates a world of symbolic and linguistic fantasy, exploring the disembodied voice, electronic manipulation, personal drama and the archetypal and psychological structures of the interior. Ether and the Voice exposes the architecture of the electronically saturated psyche, revealing the complex multifaceted relationship between human experience and technology.